“Good old a cappella, sounds good to me,” sang the Nylons back in 1991 on the group’s live album. If anything, that good sound is even more prevalent today. The success of movies like Pitch Perfect and its sequels and the abundance of a cappella groups performing across the country means the sound of voices is being heard far and wide. That includes Petoskey, which will host Six Appeal Saturday, March 10. 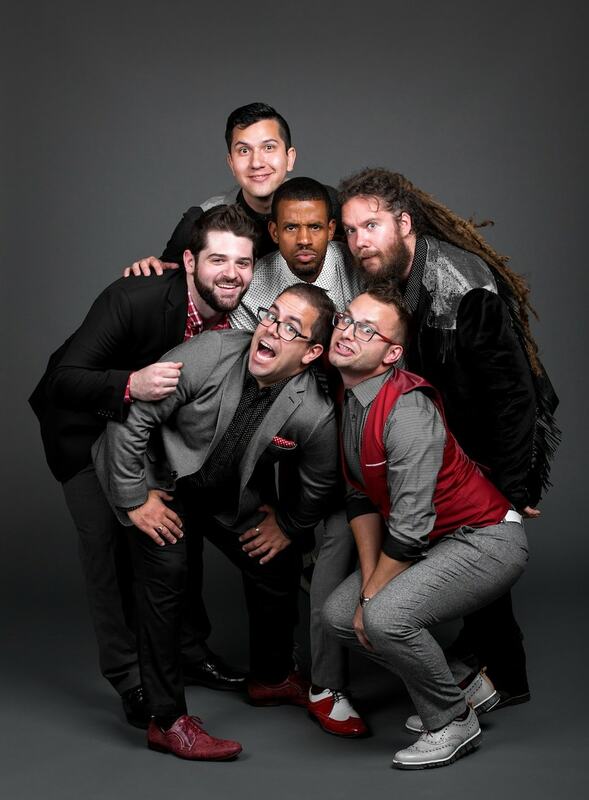 The group will perform at Crooked Tree Arts Center’s theatre at 7:30 p.m. And if any audience members are unfamiliar with the group or the style, Andrew Berkowitz has no doubt Six Appeal’s entertaining musicality will enthrall them. “We win them over,” says Berkowitz, who performs as the group’s beatbox percussionist. The group began as a hobby among some freshmen in 2006 at Concordia College in Moorhead, Minnesota. They performed around campus and eventually across the Midwest. When they graduated, two of them decided to make Six Appeal a fulltime gig, moving to the Twin Cities and finding four other singers. One of those others was Berkowitz, who at the time was trying to find his own musical way. “I was figuring out some other music stuff. I did a cappella in college, honed the craft of vocal percussion,” he says. Since reforming post-graduation, Six Appeal has expanded its repertoire and its reputation, performing across the country and the globe. It won the National Harmony Sweepstakes A Cappella Festival in San Rafael, California in 2012, as well as capturing awards for Best Original Song and the Audience Favorite Award. Carina Hume, the business manager for Crooked Tree Arts Center and a member of its performing arts committee, says she and other committee members saw Six Appeal perform at the Arts Midwest Conference in Milwaukee in September 2016. They were so struck by the ensemble’s musicality and showmanship they looked to book the group. “Six Appeal was one of the spotlight artists onstage at the Pabst Theater one night, and they were so much fun and so musically talented we just had to bring them to Northern Michigan,” she says. A cappella has many iterations: Barbershop quartets, doo-wop groups, classically trained performers like Chanticleer and the King’s Singers, and pop groups such as the Nylons and Rockapella. Today, outfits like Straight No Chaser and Pentatonix not only record and tour but host their own television specials. Yet there are still people who are not familiar with the charms of instrument-less vocalizing. “A week ago we were told by an audience they had never seen a show like this,” Berkowitz says. He goes on to say that the group loves to interact with the audience, demonstrating in shows how the intertwined sound of their voices makes for a full, rich musical performance. “We break it down. We show how all the sounds are made,” he says. As to the Pitch Perfect movies, Berkowitz says they do show some facets of the style’s appeal and have no doubt helped increase the popularity and visibility of the art form. But he also says it’s not really a reflection of what they do. “They’re pretty slapstick. We’re asked if doing this fulltime is like the movies—we’re a business. It’s a lot less comical,” he says. Berkowitz says using the music to uplift themselves and their audiences is a gift. “The best thing is being able to see all the places we go and share the music with people, talk with them after the show, change people’s perspective about a cappella,” he says. The show at Crooked Tree Arts Center is supported by the Arts Midwest Touring Fund, a program of Arts Midwest that is funded by the National Endowment for the Arts, with additional contributions from the Michigan Council for Arts and Cultural Affairs and the Crane Group. Tickets are $25 for members, $35 for non-members and $10 for students. Get yours at MyNorthTickets.com.